The wild horses life style has been researched in recent times and there is so much more to discover. 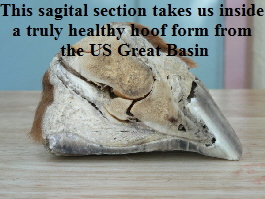 Lessons from wild horses - in these hoof specimens mustangs from the great basin - have effected tens of thousands of domestic horses thanks to the natural hoof care movement. Wild horse research has proved itself as a milestone which changed the way many horse owners and professionals are viewing 1. generic equine care 2. hoof structure and function. 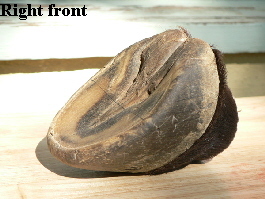 World leaders in hoof care, using both metal shoeing and barefoot trimming have embraced the significance of healthy horses and hooves in their natural habitats. 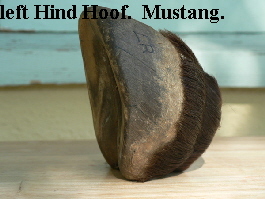 Field studies have demonstrated the hooves amazing ability to adapt. 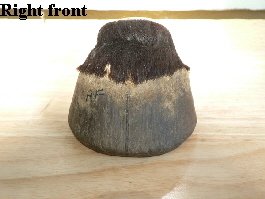 Wild hoof specimens from all over the world are providing answers that are transferable to domesticated horses lameness and wellness issues. Nature has answered the questions already: evolution dating back over 50 million years to the earliest known ancestor of the horse - Eohippus (with four toes) - has sculptured the hoof into what it is today. 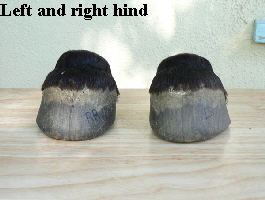 We now have examples of wild horse hooves - brought into domestication without the correct nutrition, environment, stimulation etc - debilitate quickly. Domestic horses suffer an extensive list of ailments which at their worst can prove fatal. It is clear from wild horse research that these ailments are virtually unheard of. There is a need to further our understanding to help answer enigmas in today’s equine management. Many traditional beliefs leave a shortfall in the health and performance of the domestic horse. www.wildhorseresearch.com Chris Pollit. University of Queensland. Australia. The aim of the project is to improve the foot health of the domestic horse. This will be achieved by the detailed study of the feral horse foot and comparisons to the form and function of the domestic horse foot. WILD HORSES Pete Ramey. An article to put a tear in any horse lovers eye. Click here for photo’s from our visit with Mustang’s.